A Military Working Dog being trained to use a treadmill. Some people think that training your dog to use the treadmill is an extremely challenging task. However, we have built the Big R Dog Treadmill with this specific challenge in mind. The Treadmill starts at an extremely slow pace, this design function was done specifically to help the dog get comfortable on the treadmill. The key to training your dog to use the treadmill is to start off slow and make sure that they enjoy it. If they start off scared and constantly fear using it, they will never grow to enjoy using the machine and will be constantly fearful of it. Dogs enjoy exercise the same way most people do. They feign it. That is why they are destructive or aggressive with other dogs. They need an outlet for their energy. Most people who exercise their dogs in today's world still don't give them an adequate amount. Dogs were meant to be active, it is just the way they are. They were meant to work, to herd, to track, to pull. They weren't meant to lay around and stare at the wall all day. After only a few weeks of using the treadmill my dog would literally go stand on it and wait for me to turn it on!!! She wants the exercise and enjoys walking on it while I watch T.V. or do the dishes. Most days this is after a long walk with her. The military uses them extensively to help get their dogs in shape as well. 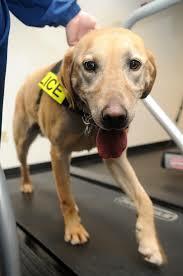 Please continue to check back as we add more videos of dogs using the treadmill. In the meantime, check out how the Dog Whisperer teaches dogs to walk on a treadmill.